I would normally go in order of precedence, but Victoria demands to be talked about first. 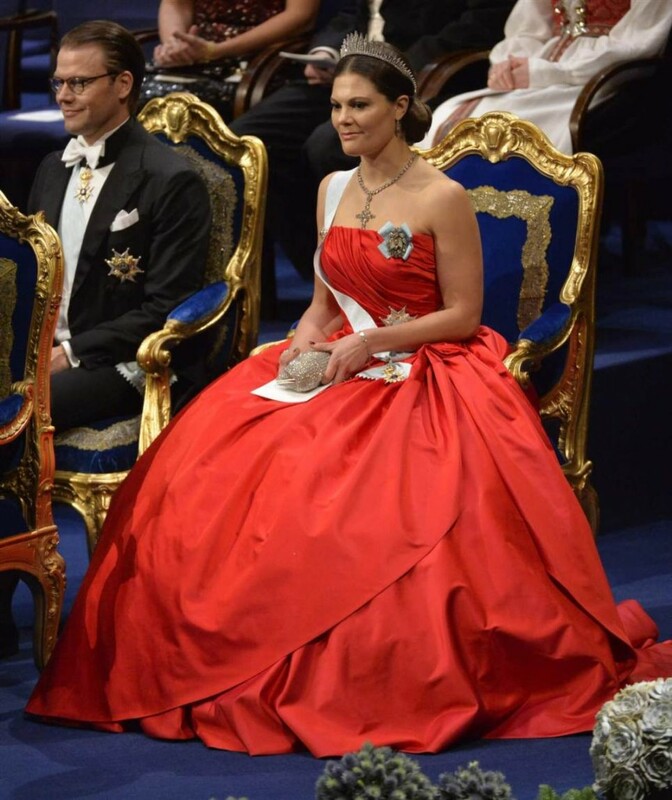 Victoria wore a strapless red silk ballgown with elegant draping, and a train at the back, designed by Pär Engsheden – a Swedish designer who also designed her 2010 wedding dress. Victoria wore a diamond fringe tiara sometimes called the Sunray Tiara or Baden Fringe Tiara, but referred to by the Palace as Stråldiademet. I’m going to go ahead and call it the Sunray Fringe Tiara for my own purposes. 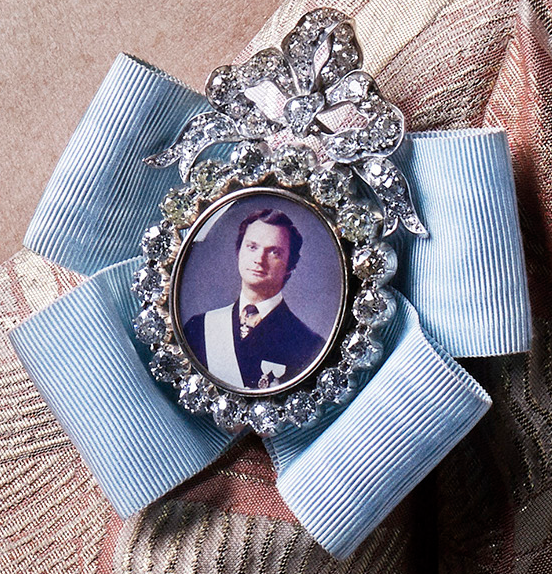 Victoria’s other jewelry consisted of a large diamond cross necklace (previously worn by her mother, Queen Silvia), a ruby brooch, a diamond bracelet, and diamond earrings. She also wore a diamond brooch in her hair. Closer look at the bracelet. Note: photo from previous portrait, but I believe it’s the same bracelet she wore for the Nobel ceremony. Victoria’s whole outfit is just perfection. I have nothing else to say. Except maybe “Aw” at the hand holding between Victoria and Danial during the ceremony. Moving on to Queen Silvia. 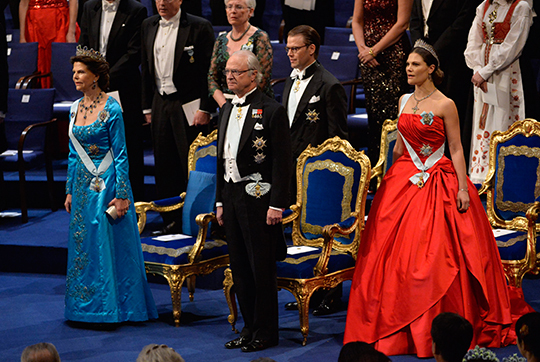 Silvia wore a duchess silk turquoise gown with sleeves and hand embroidered sequin and pearl embroidery. Unfortunately it looks rather wrinkly. 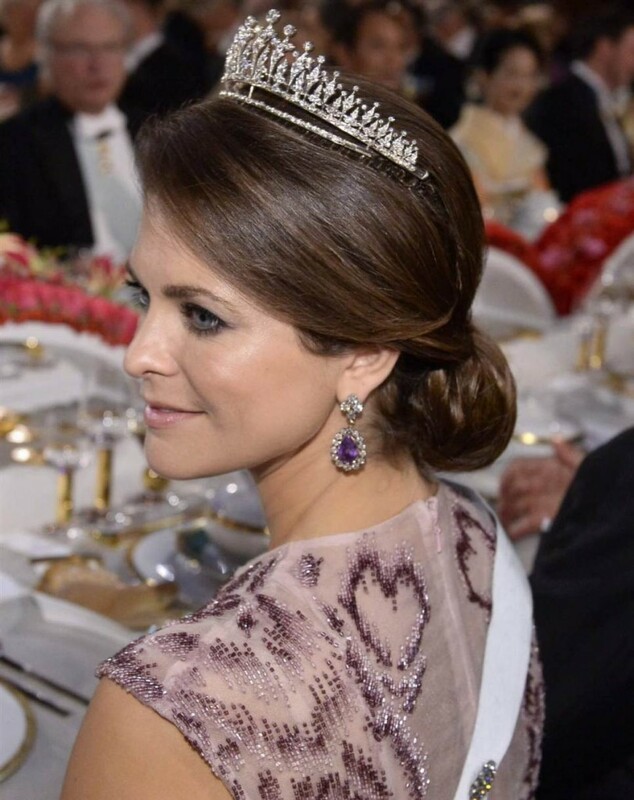 Silvia wore the Leuchtenberg Sapphire parure, which includes the tiara, necklace, earrings, and brooch. This isn’t my favorite dress from Silvia, but I love the sapphire parure. Princess Madeleine wore a Fadi el Khoury dress made out of silk organza and Italian tulle embroidered by hand with glass beads. Maddie wore a fringe tiara described as a “private tiara”, which means it’s not part of the crown jewels. However, the tiara is not strictly Maddie’s. 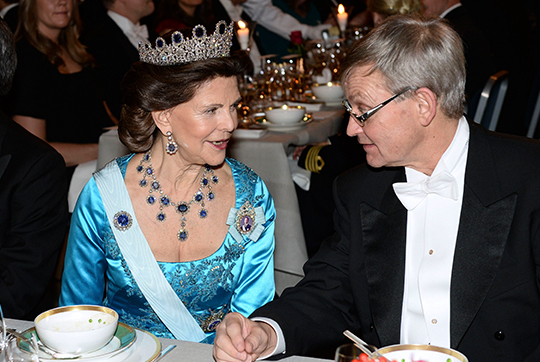 Silvia started wearing this tiara in the ’80s and Victoria has worn it as a necklace. This seems to be Maddie’s favorite tiara; she’s worn it a lot, including for her wedding last year. Maddie wore earrings and a brooch from the amethyst parure. This may be my bias showing, since I probably wouldn’t like this dress on anyone else, but I love this dress on Maddie. And the tiara and amethyst jewelry are gorgeous. Bit bummed she didn’t rock the amethyst tiara – since it’s my favorite – but this tiara is my favorite of all the fringes. Sofia wore a a duchess silk and tulle gown by Ida Sjöstedt with hand-cut and hand-embroidered sequin lace on the bodice in shades of fuchsia and eggplant. Sofia wore diamond stud earrings and a brooch in her hair which are described as private jewelry. Note the convenient placement of the embroidery at the back to cover her tattoo. I’m not the biggest fan of an exposed tulle skirt, but Sofia and the gown are pretty enough it could have worked… if the entire skirt have been made of tulle. Unfortunately, there was only a bit of tulle over a silk skirt and the tulle pulled away at times, which doesn’t look great. Honorable mention goes to Princess Christina (the King’s sister) wearing the Six Button Tiara. 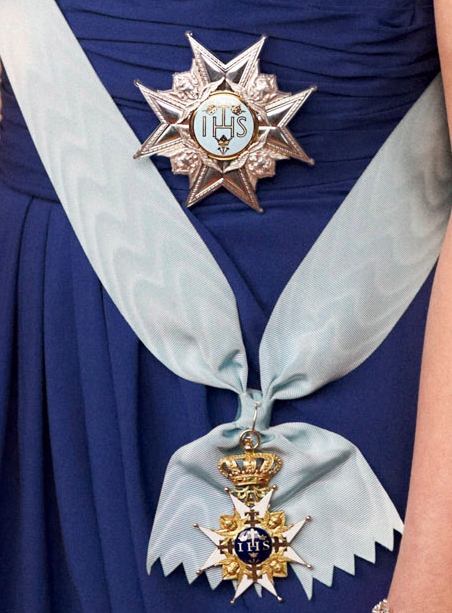 All the royal ladies (except Sofia) wore the Seraphim light blue ribbon and grand star, and a miniature portrait of King framed in diamonds (kind of like the Royal Family Order in the UK, but not exactly). Victoria’s Seraphim and Grand Star. Note: photo from previous portrait. Silvia’s miniature portrait of the King. Note: photo from previous portrait. Let’s talk food. The first course consisted of cauliflower soup with mosaics on king crab, peas and cauliflower lemon-pickled salad. The second course was a spicy fried sirloin of red deer with carrots terrine salt baked yellow beets, smoked pearl onions and potato puree. The dinner ended with mousse and sorbet of wild berries from Gotland with saffron panna cotta on brown butter. Obviously Victoria won the night for me, fashion-wise. Maddie would have won had Victoria not busted out that red dress. I’d place Sofia ahead of Silvia if I were just talking about dresses (because wrinkles), but I can’t overlook the jewels, and Silvia’s jewels just kill it. So I’d place Silvia in third, and Sofia in fourth. 85 Comments on Silvia, Victoria, Madeleine, Sofia: Which Swedish Royal lady looked best at the Nobel Prize Ceremony? Sofia sticks out like a sore thumb here. Her dress looks so cheap – shiny is never a good look. Ughh. Little bit too beauty pageant with the sequins. Sequins, satin, mesh top and tulle overskirt. If that dress could talk, it’s be screaming for mercy. Oh, my, what a hot mess, she needs a major overhaul STAT. At least her hairstyle looked good. 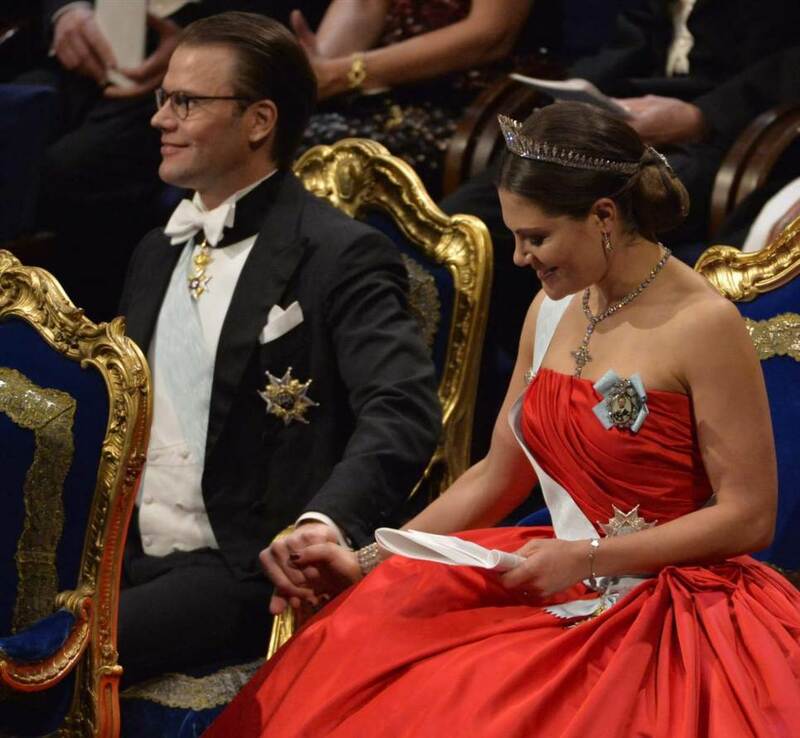 Crown Princess Victoria is just breathtaking. She looks like a queen! I know, she totally upstaged her mother. Just gorgeous. She really looked like a princess in that beautiful ballgown. Victoria was breathtaking. Vickan takes the prize! Love the gown, the jewels and the hair-do though I’m a little bit irked by the way the necklace is just a tad too long with the cross touching the bodice. The Swedish ladies are great at wearing hair ornaments! Silvia once said that many people get to look at the back of her head at these events so she tries to give them something interesting to look at. Love the Leuchtenberg Sapphire Parure. And a special shout-out to the Bade Fringe that Victoria wore – it is a beautiful tiara and Vickan wears it really well. Sophia’s hair was nice (with ornament) but the dress wasn’t good – too shiny. The woman who designed Grace Kelly’s wedding dress said something similar – that the guests would spend most of the time looking at the back of the dress, so she made the back look interesting. I love the hair pieces. It is attention to little details like these that separarates the good designers from the average. Victoria (and Maddie and Silvia) usually knock it out of the park on this date. My only (minor) quibble with Victoria’s gown – in some shots you can see her black lace bra peeking out behind the sash/order. Wise to take a page out of Letizia’s book and have the lingerie/support garments sewn-in as part of the gown’s construction. I was hoping she was expecting again, and the hint was the cross necklace. Her mother wore that at her first Nobel appearance when she was 6 weeks pregnant with Victoria. Only she, the king, and the doctor knew. Alas, Victoria sipped wine so Estelle doesn’t have a sibling on the way. I was just thinking – isn’t it time for her to have another baby? Rumor is (and rumor only) there may have been a miscarriage before Estelle. They were married in June 2010 after many years together, Estelle arrived March 2012. When Victoria was four months along with Estelle, V cancelled a big visit to New York. It was the 100th Anniversary Ball of the American Scandinavian Society and all the other Scandinavian royals were there. Daniel went without her, along with Madeleine and the King and Queen. VERY surprising that Victoria (heir) wasn’t at the event. I think concerns were strong about losing the pregnancy so an overseas flight was a no-go. Add in his health issues and her (possible) troubles going to term… Keeping fingers crossed. I was wondering the same thing, when Victoria and Daniel will have another baby. Estelle’s coming up on her third birthday. I think it’s adorable. Clearly married for love. Victoria just kills it. This is how all little girls who dreamed of being a princess imagined we’d look. I think there’s one shot where you can see a tiny bit of her (black lace?) strapless bra peeking out, but I’ll pretend I didn’t see that. I love Silvia. She could care less that her dress looks like something off the sale rack at Bloomingdale’s after the vultures pick over it at the end of season sales. She’s wearing about two years’ worth of most people’s salaries in jewels. She still rules! Prince Carl Phillip. Sigh. It is really unfair that someone gets to be a royal *and* as good-looking as a movie star. Felipe is still my husband :), but Carl Phillip can be my sidepiece. I know right! It’s like Victoria knew Kate would disappoint us to took it upon herself to blow all our minds. I love her look. 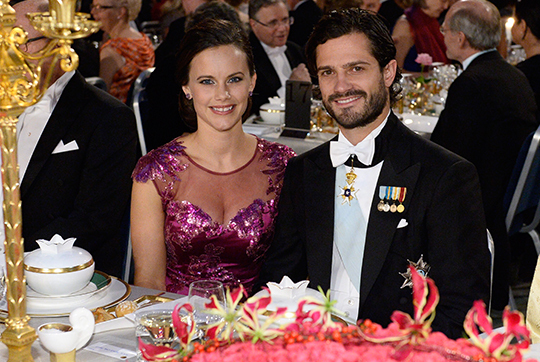 Carl Philip really is the hottest royal. William and Harry who? 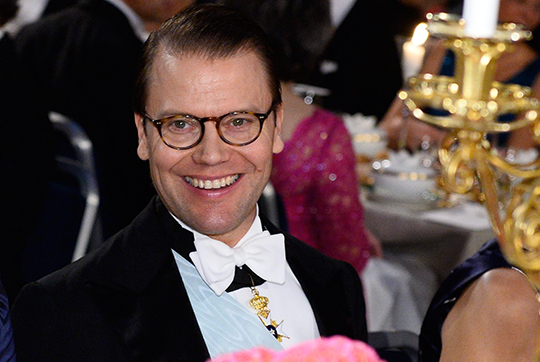 I”ll take Prince Daniel any day over any other royal. That man is just gorgeous. And his speech to Victoria at their wedding? Swoon. Daniel is the gold standard for royal men for me, too. He’s handsome, but what really stands out is his outstanding character and wonderful personality. He and Victoria make the perfect royal couple, as far as I’m concerned. Yes – and they did have some trouble getting the approval of the Swedish Parliament as I recall, but they are just so sweet together – and Estelle is an adorable little firecracker. After reading your comment, I went and found the speech on youtube. I’m now a blubbering puddle of emotions. So romantic! So beautiful! I always thought they were such a beautiful couple. And they seem to be such good people, which is far more important. They really are the fairy tale come to life. Sweden is very lucky to have them. Victoria and Daniel are one of my favorite couples. I love them together. Wait, he is my main man while Harry is my side piece, lol! Carl P. is hot. The Swedish royals definitely take risks. They don’t always hit, but when they do, they really do. Yes, this is one of the few misses for Silvia but as Faye remarked, she just loaded it up with all that magnificent jewelry. I just love her Fortress of Sapphires aka the Leuchtenberg Sapphire tiara. And Victoria’s diamond cross is just magnificent. 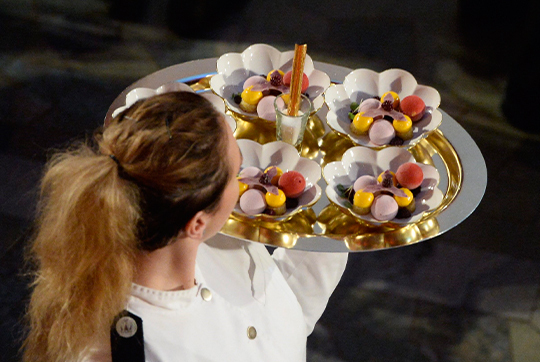 The Swedish ladies certainly brought out their go big or go home jewels and never disappoint! 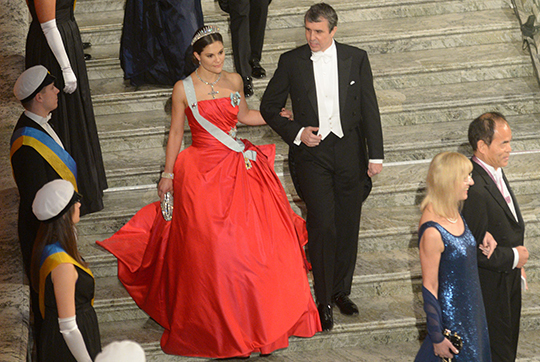 The Swedish royals are definitely some of the best in the glamour stakes, closely followed by the Danes. The Dutch are close too but mostly because they have the most well stocked jewel vault. 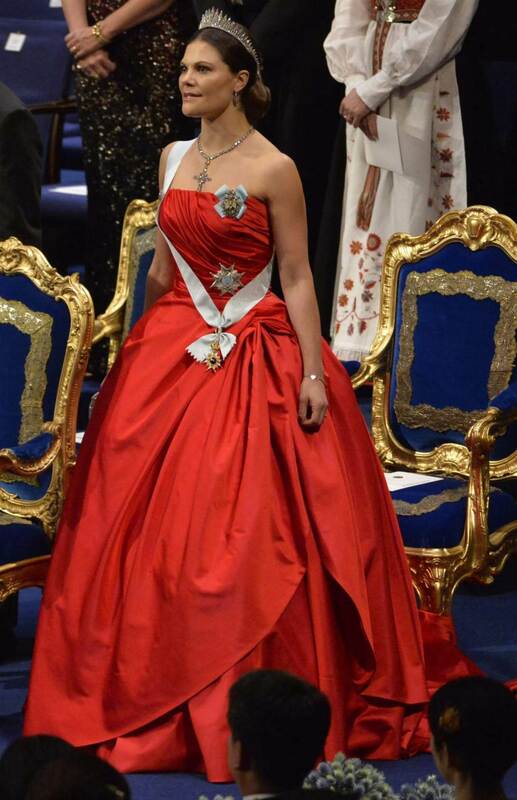 I adore Maxima but she can be a sartorial horror show but she sure does bring the bling every time. 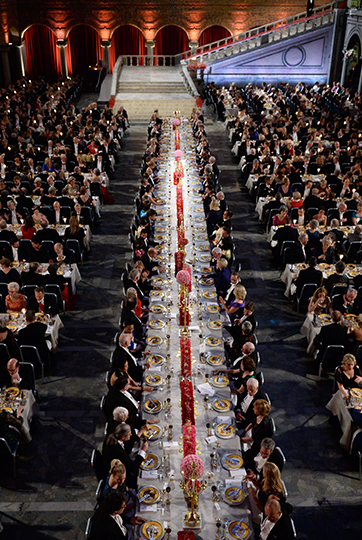 I’m really looking forward to the traditional New Year’s Gala in Denmark on Jan 1st. The royals invites the politicians and diplomats to a grand gala and the royal ladies really bring the gala gowns and the bling. Margrethe can be quirky in her sartorial choices, which I love but Mary always takes home the prize for elegance. The female PM is also always well dressed. It is an event worth checking out. I’ll keep that in mind and cover it when it happens. Yeah, Max has definitely had some huge misses in the fashion department IMO, but the amount and diversity of the jewels she wears is unmatched. Max is such a magpie; I forgive her fashion faux pas when she loads on the bling! Me too. And sometimes I think that she trolls us just a little bit – like the funny insect antenna fascinator she wore in Poland. Her face was just priceless in some of the photos, like “Yeah, I know it is a silly hat but it is fun”. Maxima has such charisma and good cheer that I more often than not look at her smile and not her clothes. I mean look at her smile and not at her clothes. Arghh, typos. I am a huge fan of hers. She always seems a bit disheveled. I mean that with a lot of love as I can be the same. She is in on the joke. She is an extremely intelligent and interesting woman IMHO. I love Maddie and think she looked very beautiful last night. I6t’s Victoria for the win for me! Like others said, she just killed it. Sofie, well the less said the better. Madeline in #2 and Silvia #3. Thanks so much for this coverage. Yes, Victoria…wow! She does look exactly like my little girl dream of a princess. But she’s not just gorgeous on the outside. She appears to be a warm, kind, engaged woman who recognizes the importance of the occasion and her role in it, yet she also appears to be happy to be there. That makes her even more beautiful. Silvia’s dress…satin doesn’t photograph well because of the shadows cast among the folds and, yes, wrinkles. This is even more obvious when it is colored satin, as opposed to white or ivory. Madeline is gorgeous and poor Sofia…tulle? Really? Tulle works well as a little girl’s tutu. Victoria will be a wonderful queen. The Swedes adore her – her father, not so much. He was actually very oppossed to the change in the line of succession as he wanted his son to become king but I think that Sweden actually gets the most accomplished and suited among the three. I an generation or two’s time there will be a lot of Queens in Europe: in Sweden, Norway, Holland, Belgium and Spain. Yes, Carl Gustaf was opposed to Parliament changing the primogeniture laws. I’m actually surprised at how forward thinking the Swedish Parliament was in that, seeing as they changed it in 1980. They just started to make that change in UK and in Monaco it was only a few years ago that they said a female could inherit, but there is still male primogeniture there. It was also only recently changed in Denmark, when Prince Christian was born. Victoria always seems so genuine and warm when she does engagements. She’s been doing appearances for a long time and she gets it and takes it seriously. Also, I love that she’s not afraid to show off Estelle. I think it is smart to introduce the children to the public gradually and at a young age so they’ll be more comfortable with their future roles. They do the same in Denmark and Norway. I completely agree. It serves two purposes, letting the public see the children, which they desire, and letting the children get used to their roles, which will help them when they are older. Mary and Fred took their children to Iceland with them a few months ago, which was great. Yes, that was the first time the twins were at official engagements. Prince Joachim and his wives have also done this. 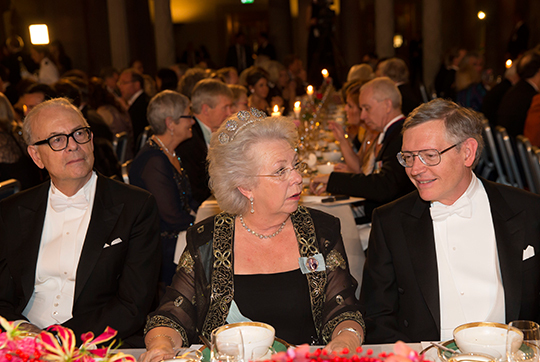 In fact, some of the children’s first engagments were with their grandfather Prince Henrik. Recently, Mary and Frederik brought their two eldest to the opening of the Children’s Art Room at Statens Museum for Kunst. It was very sweet to see the kids delving into art making, they had a lot of fun. I all fairness, George is still a toddler but it will be interesting to see how Will and Kate will handle the issue with the public when he gets older. I ooohed and ahhhed throughout this post. Victoria’s dress is just plain gorgeous, and a top 5 favorite-ever dress. She embodies how I want to dress. Madeline struck me as pretty, but loose-fitted due to post-baby body and nursing. As for Sofia… Oh dear. That dress has proud tramp stamp taste in every sequin. Ooof. Wow KMR what an awesome post!!!! I would have had to spend hours combing the internet to find these pictures. You are the best!! There are not words to describe how much I am loving Victoria’s look for this evening. This woman will make an excellent Queen someday. And that picture of her and Daniel holding hands awwww. I was worried that they were having some problems because they haven’t looked very happy lately, but if that indeed was the case it’s good to see that they’ve worked through them and are happy together again. I really liked Maddie’s dress, the color was so complimentary on her. However, I’m not a fan of this tiara. I’m not liking the way it sits up off of her head, I think without the bottom band of diamonds it would sit much better. And I seriously want those earrings! Please Santa I’ve been (kind of) good this year! Wow Silvia sure can pull off wearing the big rocks!!! That tiara looks like it was made just for her. I think she has the best tiara hair of all the royals around today, with QEII coming in a close second. Is it my imagination or were Chris and Maddie bowing when Carl and Sofia walked by?? Why would Maddie bow to her brother? All I can say about Sofia’s dress choice tonight is that I can tell she is trying very hard to get it right and I think in time she will improve. As for covering her tattoo, I kind of wished she hadn’t. As a tattooed woman, I say if you’ve got them flaunt them, if you are embarrassed by them then have them removed but don’t try to hide the things that make you who you are. I know some people question her suitability as a wife for Carl Phillip due to her shall we say indiscreet past but I say f*#k ’em. He is obviously smitten by her and she seems to be trying hard to put her past behind her and move forward, as we all are. Plus he wasn’t exactly sitting at home reading poetry when he was younger either. Silvia’s hair stylist ought to giver master classes in tiara hair though his creations sometimes become a bit too overpowering with all those fake hair pieces. I think that Mary and Marie of Denmark also have excellent tiara hair (Queen Daisy pretty much kepp to the same hair style nowadays). Funny anecdote: Mary’s hair stylist was one of the official commentators on the DR broadcast of the Cambridge wedding. He didn’t approve of Kate’s wedding hair. He said something along the lines of “if you’re marrying into an ancient royal house, you make an effort”. Well, the stylist really nailed it with that remark. Obviously, Casual Kate couldn’t even bother for a glamorous hairdo marrying into the BRF and it did not do justice to the Cartier tiara she wore. 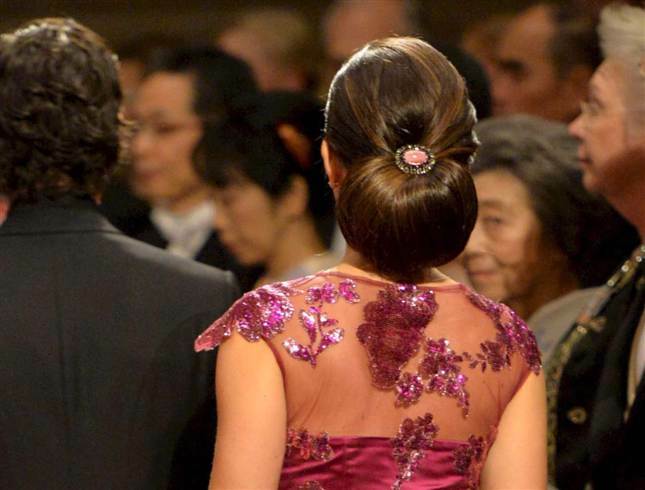 And I think the Swedish and Danish hairstylists are the unsung heroes behind the royal ladies’ look. While some styles can be OTT, the majority of them are just works of art especially when they’re jewel-studded with brooches and hairpins. Just divine. Re Mary’s hair stylist’s comments: BAHAHAHA. I agree with him. Kate should have had a better hair style that day. Maddie looks great in purple. re bowing, well Carl Philip is ahead of her in the line of succession, but I don’t think it was so much bowing as looking down at Sofia’s huge dress that was getting caught on stuff. I have a tattoo as well and while I can understand covering it for certain situations, I’d rather not, you know. I’m glad you like the post. I love all the love the Swedes are getting. Now THAT is what a future queen should look like! OMG, I would loved to be served what the server was carrying. I am always for Scarlett Ohara style gowns with tiaras, white gloves. Hair pulled back and up. I know she was not a real princess but Audrey Hepburn in Roman Holiday was just so regal. Sophie’s dress was not well fitted at all. Look at all the wrinkles at the back top. ugh..any seamstress would freak out. I really like the brooch in the hair look that several of them used. Beautiful. The picture of Victoria and Daniel looks so cute and you can tell they are communicating and a little flirty without looking at each other. Their little smiles say it all. I love the amethyst jewelry on Maddie, but then she and Victoria always seem to look great…and appropriate to the event. Victoria and Daniel’s hand holding was so cute! And so natural. Nothing feeling staged about it. Guess that’s what happens when you really love your spouse. Exactly. When Will and Kate hold hands, it feels so fake. Victoria gets it. She knows what her role means and how to fulfill it in a professional manner. A lot of people seem to complain about her fashion sense (not this dress, obviously–talk about a great choice!) on other blogs, but she’s always covered, classy, and focused on making the event a success for all involved. As someone said above, she also strikes me as deeply engaged in her position, genuinely concerned for those around her, and truly devoted to her husband and daughter. Now *that’s* what being royal should be. I think that Victoria does gala gowns wonderfully. However, her daytime wear has been really off and unflattering lately, which is too bad because she is such a pretty woman. Art Historian, would you know what type of jewel is in Sofia’s hair? It looks like some type of pink/rose cabochon stone. It looks like a cabochon, but it is hard to see. It could also be a very big conch pearl (those a pink) but I have never one so big. Ok, having looked at the photo again I think it actually might be a light blush coral, maybe carved. It hard to see though. I absolutely adore the jewel in Victoria’s hair. It geometric shap really suits the Bade Fringe Tiara. Vickan really nailed it here. She looks every inch the queen. 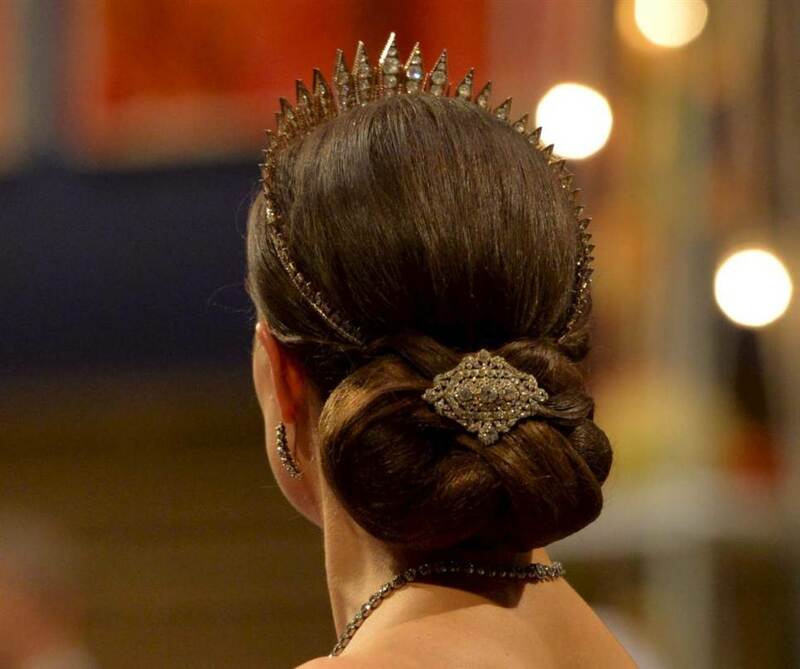 Victoria’s hair brooch is gorgeous and she looked majestic, I thought. I love how the Swedish ladies incorporate different sizes and shapes jewels in their hairdos. Yes, they are the undisputed queens of tiara hair though Mary is coming along nicely. After she had her ruby-diamond tiara adjusted, she had some extra of the jewelled leaves. She uses them in her hair now. I guess Silvia gave her a few tips. The Danish, Swedish and Norwegian RFs are very close, but as family and as friends. A friend of mine met Silvia at an event once and told me she is just so very sweet and gracious. That’s great to hear about Silvia. Love love love Victoria’s entire look. Now that’s a princess! Okay I love this post!! Prince Carl is so handsome!! And I just have to say I think Maddie is one of the most beautiful women ever. I have also thought that. Its not just her looks, but her personality. Though I think she has a stunning face. I am surprised she does not get more press because she is a knock-out! And I love that Chris didn’t take a title, showing he married Maddie only for love. To me they are a fairytale couple. I think Kate is beautiful, but she works at it. Where as I think Maddie is naturally beautiful. All these women’s up-dos are incredible!! That is how it is done. I am so impressed by these Royals. But one thing I notice is though they all scream ‘regal’, they also seem human. By that I mean they are not afraid to touch each other like a normal human does. You can actually seem emotion and love. There is not quite the air of ‘I’m better than you’ that you get from the British Royals. The British Royals are more stuffy and reserved. The Swedish royals seem to have the right balance. – this pretty much sums up one of the big differences between the BRF and the European royals in general (not just the Swedes). It is time to loosen up that stiff upper lip. Though Charles seems to have begun – the pics from his and Camilla’s recent South American tour are very funny. He’s letting out his goofy side, which is kind of sweet. I agree with you that Maddie is a very beautiful woman. And she looks great in purple. I also love that Chris didn’t take a title; I love that he’s down to earth and doesn’t really care about that stuff. I agree with you and Art Historian that the Swedes and other European royals seem a lot less stuffy than the Brits do, and yet the European royals still seem regal. They don’t have to be all uppity to command that regal-ness , you know. I think that a lot of the “regalness” has much to do with stage managing. The continental royals often do more grand events, where the press is allowed. And QMII is a master when it comes to set a grand stage for the monarchy – but then she has a keen interest in the theatre and has designed costumes for several ballets. I think it is a shame that QEII doesn’t allow the diplomatic dinner to be filmed like they do in Denmark at New Year’s – it is a great occasion to display the pomp with gala gowns, tiaras and horsedrawn carriages (of gold). 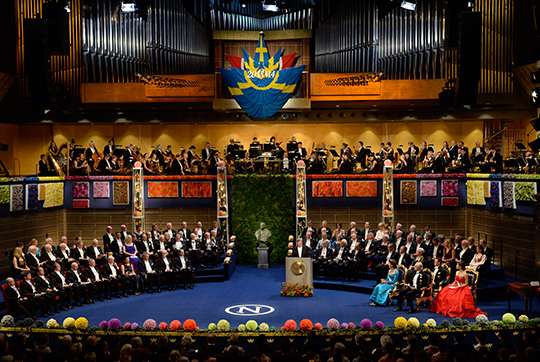 The New Year’s Gala and the Nobel Dinner are great examples of how to display the pomp of royalty without sacrificing their humanity as stiff, untouchable royals because that idea of royalty is deeply irrelevant in todays constitutional monarchies. I think the BRF shoots themselves in the feet with this “stiff upper lip” – they need to be both grand but also relatable because they exist on the sufferance of the people, not by divine will. It is also why I’m glad that Denmark don’t do coronations – the monarch is proclaimed by the PM and that is that. A coronation reeks of old-time absolutism and that has no place in a modern democracy, even if it is a constitutional monarchy. I completely agree with almost everything you said, except I actually like the coronations because of the pomp and ceremony. It’s fun to watch. I love a good ceremony, especially if it is historically related. I dread to think what the coronation will be like of William if he makes it to the throne. He’ll probably cut a lot of stuff out, which would be a shame because the pomp and pageantry is amazing. I love watching the pomp and ceremony of royalty as well but this is one ceremony that I just can’t approve of, and that is purely down to political reasons. I agree with everyone else. Victoria has thrown down the gauntlet. Wow. She looks amazing. Victoria looks amazing! Just as a Princess should look! All the royal ladies hair looked great and I love the extra little touch of having a matching brooch to hold their royal sash in place. Loved Mddie’s — dress except for the color. You don’t like the purple?